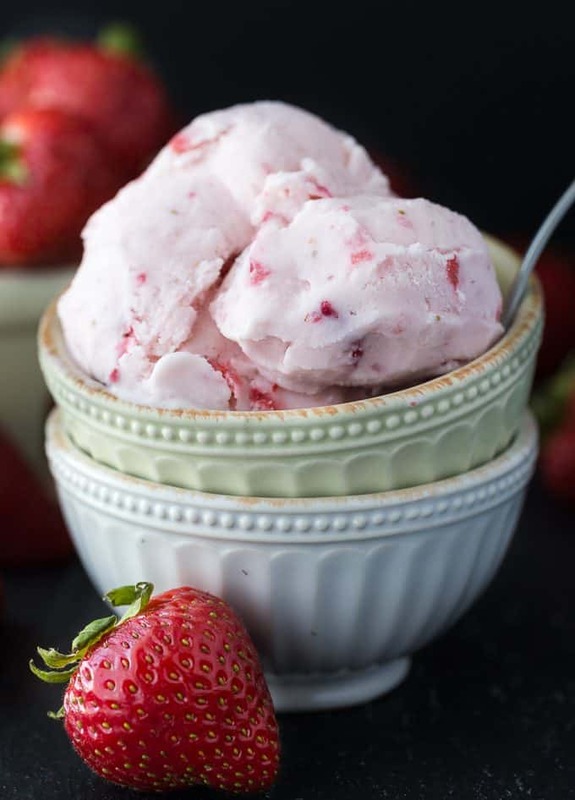 This Strawberry Ice Cream is so creamy, sweet and luscious! 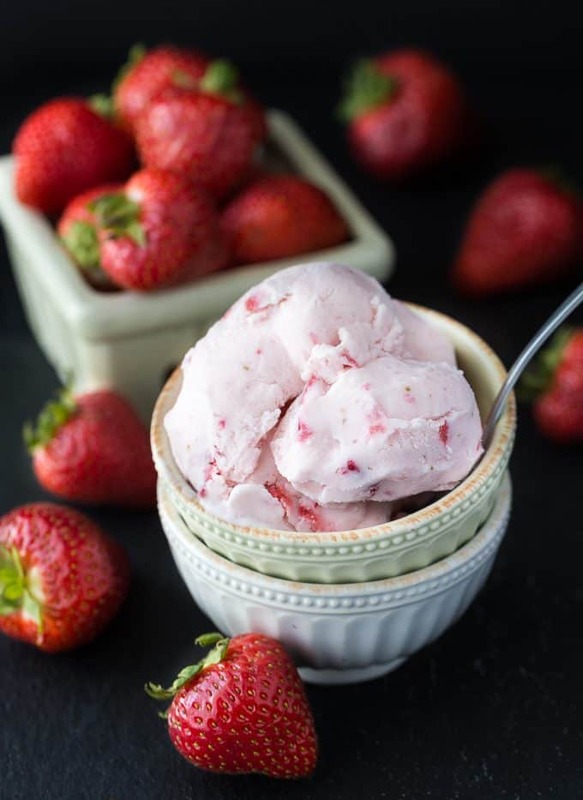 This fresh ice cream recipe is ready in a matter of hours and super simple to make at home with your ice cream maker. I’m loving my new ice cream maker and shocked at just how easy it is to use! You can enjoy freshly made ice cream in a little under an hour. I prefer my ice cream to be on the firmer side so I normally let me freeze for a few hours. Soft serve ice cream can be enjoyed almost right away. It’s very little effort for such a delicious result. This particular recipe takes a tad bit longer to make because you need to let the sliced strawberries soak in lemon juice and sugar before you incorporate them into the recipe. I didn’t use anything artificial in this recipe. The pretty pink colour is all from the strawberries themselves. And the taste! Oh my. 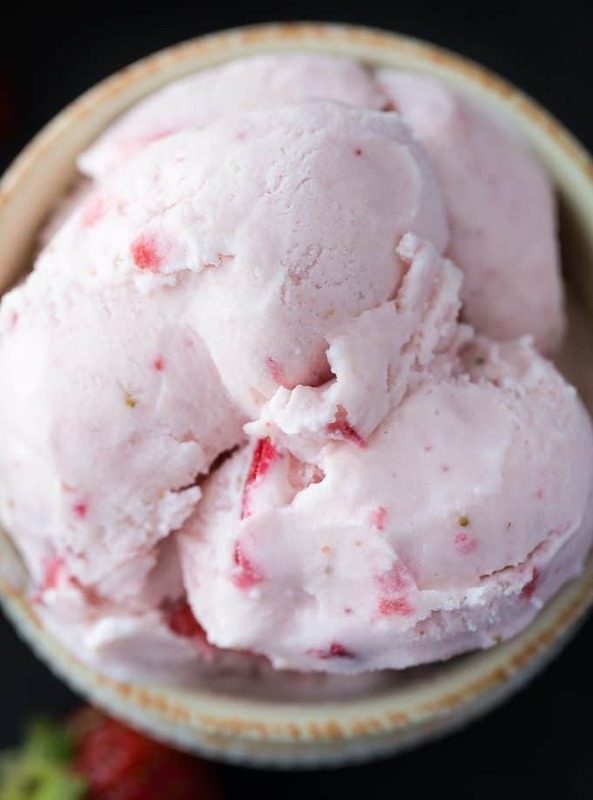 The strawberry flavour is bursting out of this sweet, creamy, smooth ice cream. It’s better than anything store bought that I’ve tried! This recipe makes about six servings. I put mine into a few freezer containers. With all this ice cream I’ve been making lately, I really need to splurge on a deep freezer. My teeny tiny freezer is packed full right now. Eek! Don’t have strawberries? Substitute blackberries, blueberries or raspberries instead. Keep an eye on my Dessert recipe box for more ice cream recipes to try! You might also like this Vanilla Bean Ice Cream or Mint Chocolate Chip Ice Cream. I’d love some suggestions for ice cream recipes I should make and share on my blog. Let me know in the comments! So creamy, sweet and luscious! 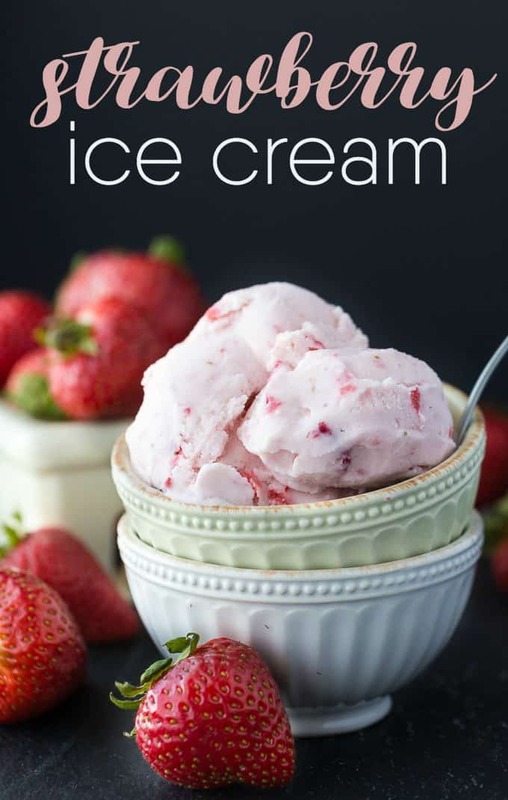 This fresh ice cream recipe is ready in a matter of hours and super simple to make at home with your ice cream maker. Add strawberries, lemon juice and 1/2 cup sugar to a bowl and toss to combine. Let sit for two hours. Strain the berries and reserve the juice. Add half the berries to a bowl and puree with a hand blender. Mix milk and 1 cup sugar on low speed for 2 minutes. Stir in table cream strawberry juice, pureed strawberries and vanilla. Pour into the ice cream maker’s freezer bowl. Mix for 25 minutes in the ice cream maker. Add in the rest of the strawberries about 5 minutes before it’s done. Transfer the ice cream to a freezer container and freeze for at least two hours. I have an ice cream maker but didn’t make any ice cream this summer. 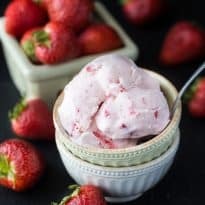 It would be nice to have some homemade ice cream to go with a nice homemade pie, and this recipe sounds perfect and easy! I want to try it! This is such a pretty ice cream recipe! I love how easy it is to make and looks so delicious. This is such a healthy ice cream without all the chemicals! 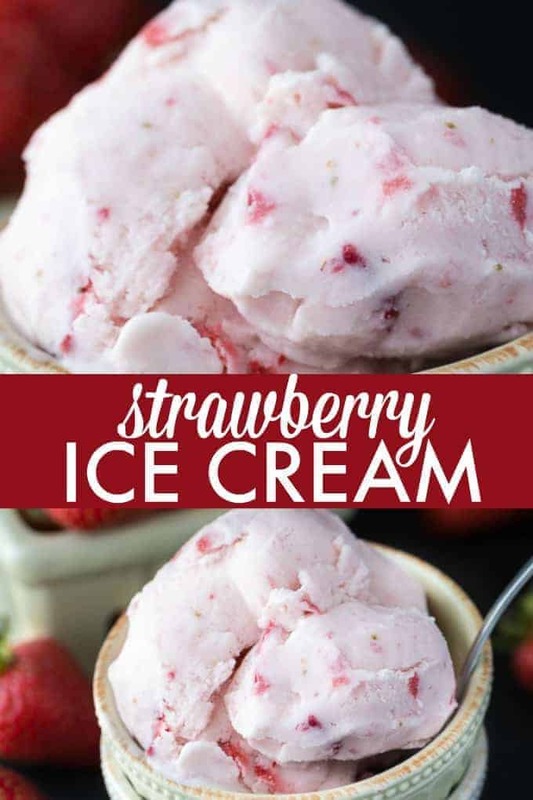 We love making homemade ice cream, so I’m going to have to try this for my family! It would almost be awful to have to wait the 2 hours for the strawberries to get ready. Looks like wonderful ice cream. 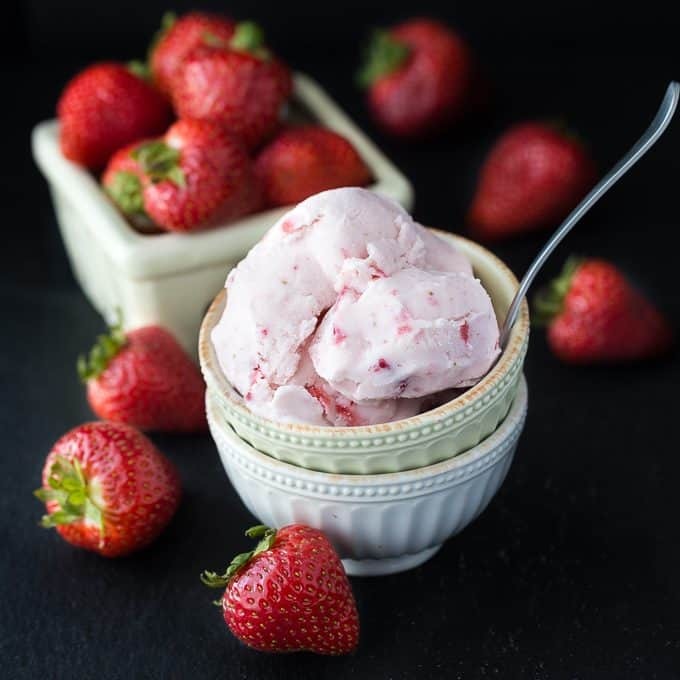 What a delicious recipe, it is still warm enough here to really enjoy ice cream. Thanks so much for sharing with us at Full Plate Thursday and have a great week!